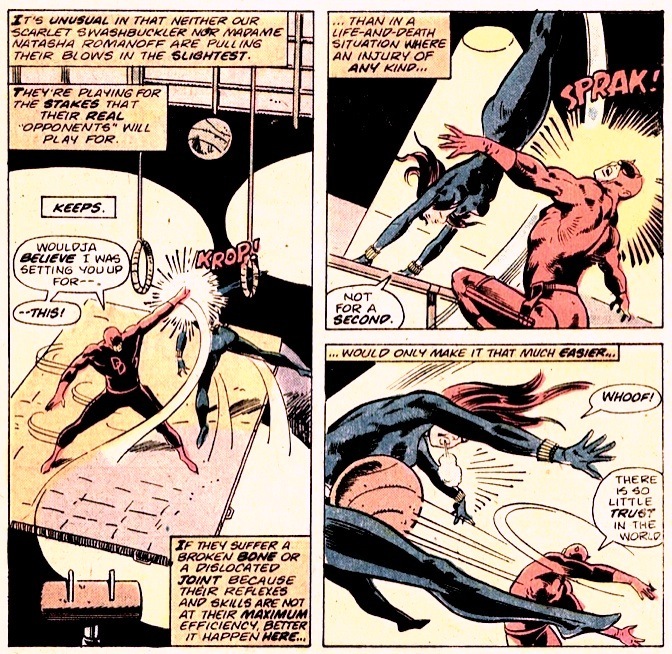 We know Matt isn’t always Mr. Nice Guy, but the panel below, in which he throws a medicine ball at Natasha with enough force to send her flying across the room, pretty much proves it. On the other hand, this could be him actually making progress in his treatment of women. That is, he’s treating Natasha like she’s a man, and not pulling any punches. Also, they had recently broken up at the time. I don’t want to speculate, but there might have been some unresolved issues between them. Not to mention the “Pym Backhand” in the first panel. There is also that one time he threw a baby off the side of a building. Good thing Natasha was there to catch it. Ha ha! Yeah, there’s also the issue where he pushes a little girl down an elevator shaft. Though she was actually a robot, so that’s something of a mitigating circumstance. Hahaha XD, the last panel is hilarious! Good thing their practicing for what can happen on the street. A medicine ball fight can deadly in the real world?